Fly Fishing In Alaska - The Alaskan Sculpin - Fishing This Dynamite Pattern For Trophy Alaskan Rainbow Trout and Char! Salmon streams where trout or char are present. As a flyfisher I've wondered, "what is our aversion to the sculpin?" Most have heard of it, many know it can be effective (sometimes deadly) but it's probably one of the most underused flies we carry or don't carry as is often the case. I've come to the conclusion that we probably don't really understand the sculpin. Such a secretive little fish, yet so important in the food chain of Alaska's freshwaters. What is it? Where does it live? What is its behavior, and most importantly, how do we fish it's imitation? Like many things in life, if we don't understand something we're more likely to shy away from it in favor of the things we're more comfortable with. Flyfishing the sculpin is like that! After all there are so many effective naturals we've been imitating for years that we're successful and comfortable with that spending the time onstream and off learning an entirely new imitation and the techniques required to fish it can be a little overwhelming. But are the sculpin and presentation techniques really different from other artificials? Yes! I guess the fish itself is somewhat unique and a little odd, but some of the tactics necessary to accurately imitate the characteristics of the fish are unconventional. The Sculpin, of the family Cottidae, are incredibly diverse in its range and variety of habitat as well as particular species present, but also remain surprisingly obscure. They're present in nearly all Alaska waters but the average fisherman may never see one. Why? Well, they're small being about two to three inches long, with their backs a mottled olive to brown changing shades to match the streambed at any particular time. They have no swim bladder, which enables them to comfortably make their home lying about the shelter of the bottom structure. They won't be found on a silty bottom but rather hiding in the crevices formed between medium to small rocks, lying motionless making visibility and predation difficult. Are they really obscure? Well, that depends on your perspective. To me, yeah. To the trout and other predatory gamefish NO. I've seen a number of sculpin while wading the streams of Alaska and I'll intentionally look to help me make onstream fly selections, but even then they don't seem abundant when I know they're present. The sculpin's survival is aided by some excellent attributes of camouflage and stealth, as well as being speedy and evasive; but rest assured they do get eaten. While wading in clear water streams with rocky bottoms watch near your feet as you walk. They're admirably camouflaged and hold like a cagey gamebird, but like a game bird they flush. Exactly; they hold position until the last moment, lying motionless on the bottom until your approach is imminently close then they crack. Flush or hops are great descriptions of their flight. They're not casual (steady) swimmers hovering in the current like the majority of the fish we're familiar with, but go from point A to point B right now when they decide it's time. The distance of their flight is short, measured in feet that you could count on one hand. That's what keeps them alive. Hide in a protected spot then move quickly to a new spot and dig in before you get intercepted. Good plan. This is where we get to the part of imitating the natural. You've no doubt started to get some idea of the challenge posed with imitating these cagey little food sources, and may wonder if it's really worth the effort, but like any good plan there are loopholes. Lying amongst the rocks the Sculpin feeds on small minnows and aquatic insects, waiting motionless with the appearance of another stone until the prey is within striking range of their prominent mouth, then they strike. With the voracity of more notable predators, they feed remaining relatively concealed. But like any hunter, you occasionally need to change the scenery moving to new grounds. This is when the sculpin is exposed. If the rainbow is near he may take the sculpin in mid flight, or may pursue it into its next hide. The rainbow, like myself has learned that the sculpin can be flushed into another hop, spelling trouble for the little fish. He is indeed agile and quick among the rocks but tires quickly and is often pursued to death. 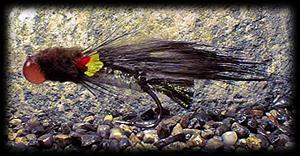 To imitate the characteristic hop of the sculpin you'll need a fly tied like a rock. Cast across the area you've chosen to work, giving slack line as the fly drifts and sinks allowing the fly to eventually settle onto the bottom. Weedless or inverted hooks are invaluable now to avoid the frustration of multiple snags on the bottom and the inevitable loss of gear. After the fly has settled, the hop can be achieved by simply pulling the fly off the bottom, lifting then allowing the fly to settle again. The rainbows have been conditioned over time to recognize this unique motion and associate it with the sculpin. As the rainbow quickly pursues the motion of the rise and fall, the next hop comes. WHAM, there's no fooling around here, the rainbow strikes the prey with force sufficient to stun the small fish as eating can be a technical matter at a high rate of speed. He may get lucky and take it down but he may need to turn it and finish the job. When the strike comes, attempt to restrain the uncontrollable urge to pound the hookset until you feel the weight of the fish. Sculpin bunch up and spawn like most fish and may be concentrated in the spring as they're tending nests. Rainbows and other predators have lived on the sculpin all winter in the absence of the big egg and flesh feeds to come but would no doubt recognize and welcome this diverted congregation while waiting for the salmon to arrive. Once the salmon finally arrive the sculpin is a player again. Like most fish the sculpin raid the redds of the salmon dining on the abundant high protein eggs. The salmon are adept at defending their redds and lash out with kyped jaws and mutated teeth. The dining can be fine for the sculpin but death can come swiftly from the enraged spawners. The salmon will strike but don't normally consume the victim of their attack which often times leave the dead or dying sculpin adrift in the current unable to scurry back to the shelter of their bottom hugging home. The 'bows and char staged below the redds find this offering a welcome addition to the eggs they've been waiting for. Dead drifting or a short jerky strip retrieve in the vicinity of the salmon redds can be a superb technique. Imitations come in a multitude of patterns and shades although most should generally possess certain characteristics particular to the species. Sculpin rarely exceed four inches and have a disproportionately wide flat head and prominent pectoral fins, with the body tapering down to a small tail. (They are in essence a tiny bullhead.) Their back and sides are mottled shades of brownish olive to near black adopting colorations consistent with their habitat. The underside of the head and belly are lighter to whitish. An imitation that looks like the natural is favorable but an imitation that behaves like the natural is essential! Sculpin are present in many freshwater lakes, rivers, and oceans offering a constant year round food source for a wide variety of predatory fish. These techniques and others found by onstream experience may provide some of the most consistently productive types of fishing and are well worth the time invested to master them. Brad Hanson's sculpin patterns illustrated in this information can be tied by anyone with the right materials and a bit of practice. AFO provides the instructions for both the Slimy Sculpin and the Hanson's Thief (an egg-sucking version that is quite effective during the spawn). You can find both of these patterns listed in the Fly Tier's Bench NATURALS section.